SP-4223 "Before This Decade Is Out..."
Geneva B. Barnes in 1999. Photo courtesy of NASA. Born in Tahlequah, Oklahoma, on June 29, 1933, Geneva B. Barnes was first encouraged to enter into government service during her senior year in high school. It was during this time that her business administration teacher urged Geneva (who likes to be called "Gennie") to apply for a job with the Navy Department in Washington. A civilian recruiting officer visited their school looking for talented stenographers and Gennie, along with her two best friends, took the civil service test and received appointments with the Office of Naval Material. This marked the beginning of a 41-year career of Federal service. After working with the Office of Naval Material for four years, Gennie accepted a position at the Pentagon in the Office to the Judge Advocate General (JAG). Subsequent career positions include being secretary of the Regional Director of the Washington Regional Office of the Post Office Department (now the U.S. Postal Service). In 1962, Gennie began her career with the space program as a secretary in the Office of Programs at NASA Headquarters. The following year she moved to the Office of Public Affairs where she worked as secretary for the next eight years. Gennie did much of the "behind-the-scenes" work associated with NASA special events, including White House ceremonies and other astronaut award  ceremonies and appearances. During the Apollo missions, she assisted in protocol activities at the Kennedy Space Center for four of the flights, including Apollo 11. It was during this time that Gennie served among a select group of support staff who accompanied the Apollo 11 astronauts and their wives on a whirlwind presidential international goodwill mission following their successful Moon landing. From September 29 through November 5, 1969, project "Giantstep" traveled aboard the vice president's plane visiting 22 countries in 38 days. Gennie's career at NASA included a brief stint as a public affairs assistant to Neil Armstrong while he was the deputy associate administrator for aeronautics in the Office of Aeronautics and Space Technology. 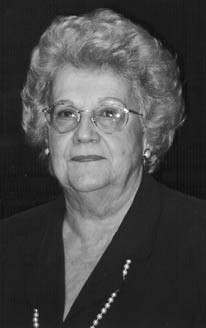 From February 1972 to July 1973, she served as administrative secretary to the associate administrator for Aeronautics and Space Technology. Other positions held include administrative secretary to the assistant administrator for Equal Opportunity Programs (1973); administrative officer, Office of Aeronautics and Space Technology (1973-1980); management analyst, Office of Management Operations (1980); astronaut appearances coordinator, Office of Public Affairs (1980-1984); and astronaut international appearances coordinator (1984-1994). Since retiring from NASA in 1994, Gennie now spends some of her time doing volunteer work at the White House in the e-mail section of the Presidential Mail Office. Editor's note: The following are edited excerpts from an interview conducted with Geneva Barnes on March 26, 1999, by Glen Swanson at NASA Headquarters as part of the NASA Johnson Space Center Oral History Project. How did you become employed with NASA? I was working in the Postal Service at the time that I became interested in the space program. John Glenn flew his Mercury mission and I stood out in a misty rain on Pennsylvania Avenue watching him and Lyndon B. Johnson drive down Pennsylvania Avenue in the parade that Washington, D.C. gave to welcome him [John Glenn]. I went back into my office and called the NASA personnel office and asked if they were hiring secretaries and they said "yes." I took my application the next morning to the personnel office and I was on the payroll by 10 o'clock. [Laughter] That was in the days when NASA could do that sort of thing. What was your first function at NASA, what area did you first work in? My first job was working in the old Office of Programs which was headed by DeMarcus Wyatt and it was part of Dr. Seamans' staff. They were planning the lunar missions, how to get there and what might be found once they got there. He had a staff of engineers whose job it was to work on that. I worked there for a year and then I went to work in Public Affairs for the late Brian Duff, who had just been hired by NASA. He had been a newspaper man and was brought in to head up a section of speech writers, mainly to support the administrator. He also coordinated some of the administrator's public appearances and traveled with him. Later, Brian and his staff began handling the astronaut public appearances for special events and post flight activities. I absorbed a lot of what he was doing by helping him put together these itineraries and speaking commitments. Now when you say handling public appearances, were you in the decision making process? No. I was still a secretary. I remained a secretary, although as I worked in that office longer and it changed hands, Brian [Duff] moved on to something else and then Wade St. Clair came in. However, I was working in other functions such as the protocol operations at the Kennedy Space Center for the Apollo launches. We also helped with arrangements, setup, transportation, and that sort of thing for a couple of the astronaut funerals here in Washington when they were brought here to be buried. C.C. Williams was one. I was really branching out and doing more things than strictly secretarial work and that was how I spent most of my career at NASA. I moved into what they called the professional career series, not that secretaries aren't considered professionals, but I moved into the professional series when I went to work for Neil Armstrong after the Apollo 11 world tour. My job for him was to answer all of his public mail. He had a secretary who handled his public appearance requests and I rarely got involved in that. Mainly my job was to answer the public mail. After he [Neil Armstrong] left the agency I floated around in a couple of other offices as a management analyst and administrative assistant. Then I had an opportunity to go back to my old office where I had started in public affairs and I began working on the Shuttle astronaut schedules. I was hired as an appearance coordinator and set up their appearances after they flew on Shuttle missions. For the earlier crews, their public appearances began after the post-flight debriefings and lasted about a month. I traveled with the first five Shuttle crews to locations in the U.S. and stayed with them until their appearances were over. After the Apollo 11 crew returned from the Moon you were involved with this world tour. I was wondering if you could share your stories about that. To my knowledge this was the first time that there had been a world tour for a crew of astronauts. There had been international appearances by astronauts before but to my knowledge, this was the first time that a crew had been sent on a world tour. President  Nixon wanted to send the Apollo 11 crew, the first crew that landed on the Moon, to share information gained from the flight with other nations and to share plans for future space exploration. The State Department and some of the President's staff set about working on this project with NASA. We did a lot of work to get ready for it. We spent a lot of time over at the State Department putting together briefing books and proposed schedules which changed as we went along. When did they start as far as the initial planning to get this tour going ? We left Andrews Air Force Base, on September 29, and went to the Johnson Space Center [JSC] to pick up the astronauts and their wives. Bill Der Bing and Dr. Bill Carpentier were the JSC staff members.2 Our first official stop was in Mexico City.3 We did that all in one day. We went from Andrews Air Force Base to Johnson Space Center to Mexico City which was a preview of things to come. You didn't really have a rehearsal for any of this. The planning for this appeared after the mission was completed. They had not talked about this prior to the actual mission? You know I don't know at what point they started talking about it. My boss, Wade St. Clair, and Julian Scheer, who was head of Public Affairs for NASA at that time, were the people that were involved in talking to the White House people and the State  Department people. The overall mission director was the deputy chief of protocol for the State Department, the late Nicholas Ruwe. Of course, NASA had to agree to it before they could start any of the planning, but I'm not privy to when it actually started. Their first trip was to Mexico City and again it was pretty much the astronauts and their wives. Did they have any other friends or relatives accompany them? No, it was just them and the support people. 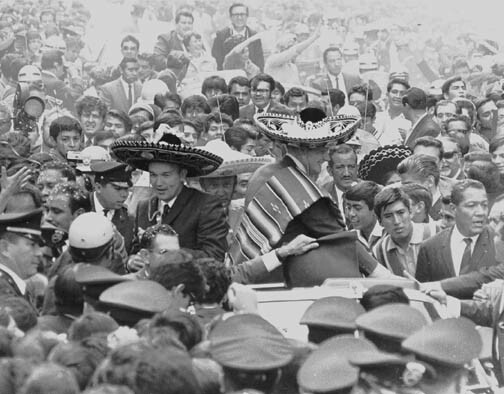 Mexico City had an airport arrival ceremony involving Mexican government officials and the American Ambassador, followed by a motorcade. That same day, there were civic events, a meeting with the President of Mexico, a news conference, and a reception hosted by the American Ambassador. The countries that you decided to visit for this trip . . . those were planned in advance? Did you have to make the preparations, the contacts, and so forth well in advance? Were their some countries that you asked to visit and were declined? The State Department contacted American embassies in the countries being considered to visit. For instance, I believe there was a plan for us to go to Israel and Egypt in the first proposed itinerary. But that was taken off, presumably for political reasons, I don't know, but we didn't go there. The proposed stops were all planned out by the State Department working with American embassies in a lot of locations. I don't know the process they used to take different countries off and add others. So the trip to Mexico City was the first stop. Did you learn some things from the first stop in anticipation of what was to come? ...in the astronauts even up to the time that we landed there. I believe that there were local people trying to get on their schedule, to get them to appear at various things. There was quite an effort to hold down on the number of events they could do in one day. I believe that the people in the decision making process probably got a taste of what it was going to be like, that is, being pressured to add last minute events. From that viewpoint, we learned a lot of what was about to happen to us . . .
We went on to Bogota [Colombia]. Generally we were overnight in most of these places, but in Rome and Bangkok we spent three nights. Colonel Aldrin left the group in Bogota for a trip to the U.S. for a speech in Atlantic City and rejoined us in Las Palmas [Canary Islands]. Did they stay on the aircraft overnight? No. The State Department had arranged for a section of the hotel where we were to stay to be blocked off just for us, just for the astronauts, their wives, and the staff people. We had a control center in each one of these little sections. The Embassy staffed it. We had office machines to use, typewriters, copy machines. There we could assemble schedules and type up 3" x 5" cards that the astronauts liked to use with their notes. I would type these up. We also had office space in the back of our aircraft. We tried to keep up with thank you notes. We started in Mexico City and after we left there Armstrong had some things that he wanted dictated to people that he and his wife, Jan, had met. I did some of those. But as we moved along, we found that there were so many people to thank for so many things that we couldn't keep it up. We ended up just keeping a list of people, their affiliation, and the address. When the trip was over, the State Department and the local embassies prepared appropriate thank yous to send back to the people. The trip to Brasilia [Brazil] after Bogota [Colombia] was an unexpected stop. The U.S. had suspended diplomatic relations with Bolivia and we weren't allowed to use a more direct route over Bolivia to get from Bogota to Buenos Aires and Rio de Janeiro. So after leaving Bogota, we stopped in Brasilia. We were there an hour and a half for a refueling stop. We got a tour of the city in a bus. The mayor and other representatives from the local government met the astronauts in one of the official buildings. The two official buildings there are shaped like saucers. I couldn't get over that. You know you're probably right. After all these years I hadn't thought about it. The mayor and his delegation met the astronauts for an official welcome and that was the extent of what we did in Brasilia. It was straight forward and uncomplicated. I think we were two or three days in Rio de Janeiro. From there we went to  the Canary Islands and we were already getting tired. People were starting to become ill by then. It just started with one or two people with sort of flu-like symptoms and then as we got into Europe, everybody had been ill, including myself. I became ill in Madrid along with two or three others. There is a picture that somebody had of one of our staff sitting on the curb in Madrid after getting out of the car to wait for a medical person to come and take him to the hotel. When we got to London, Dr. Carpentier went on national television to deny that the astronauts had brought back a lunar sickness and that all the staff were becoming ill as a result of being exposed to this illness. We were involved with a lot of time changes and trying to avoid local foods that would cause health problems. With that much closeness you eventually got on each others nerves. We were staying together in the same part of the hotel right next door to each other. When we were flying from one place to another we were all confined in an airplane that got to be kind of small . . . I think that all of us eventually came to look upon the airplane as being home away from home and we were glad to get back to the airplane. The crew would always welcome us like they were totally rested and were ready to help us out with whatever we needed, cooked our meals, and waited on us. We could eat the food, we could drink the water, we could take a nap. You mentioned that people got on each other's nerves during the time. Were their any incidents that you can recall that stand out? No, I don't think so. But somebody very cleverly designed a silly thing to break the ice and to help keep everything in proper perspective. They called it the "personality of the day." If you were caught being unkind to somebody or having an attitude problem, you could be assured that you were going to appear in one of these write-ups. These were humorous little things that were passed out once we got on the airplane. Just silly little things that kind of made us laugh. You were tired. You couldn't get proper sleep. It just stood to reason that you were going to be on the edgy side sometimes. Was there a press group with you that wrote reports and news articles and then transmitted these through the local embassies to the local papers back home? Yes. We had two USIA [United States Information Agency] advisors and four Voice of America [VOA] staff members traveling with us. One USIA fellow was a writer and one was a photographer that recorded all of the stops. They were filing reports through their agency channels and were giving information to the local press. There were also news conferences at all of the stops. One of the VOA staff members was a motion picture photographer who recorded all the major events in all the cities. Before we left on the trip, there was some discussion about one or two press reporters being allowed to accompany us on the entire trip and flying on the plane with us. But this idea was scrapped. I remember seeing in one of the photographs that were taken on the tour, perhaps it was in the Canary Islands or it might have been in Zaire, the crew were greeted by a group of local dancers . . .
. . .There was an evening social event in Zaire at the president's palace. There were dancers there and I know that one of the aides to President [J.D.] Mobuto had an evening banquet to which all of the staff were invited to attend. None of them were women, and, as I recall, the theme of the dance was "Stalking the Lion." They were all men but they obviously had just come in from the bush and hadn't bathed in months. [Laughter] That was quite an experience. They were gaily clad in their costumes and feathered hats. There was also a more public evening program where dancers performed. I remember Buzz Aldrin leaping over the guard rail where the astronauts were seated and started dancing with members of the group. Quite a crowd pleaser. The picture was in the local newspaper the next day. I noticed that gifts were exchanged during these visits.4 Can you recall any interesting stories about some of the items and exchanges that occurred while these gifts were presented? Most of the staff were not included in the official state receptions where gifts were exchanged. When you went to Berlin was that particularly memorable? The staff was included in the motorcade through the city, en route to city hall and there was a stop for astronauts to visit the wall. We passed a couple of check points and saw a Russian tank at one. The astronauts were accompanied there by the mayor and the U.S. embassy people. The astronauts made brief remarks at the wall, mentioning a young man who had recently been shot leaping to freedom, and they signed an official visitors book. I don't know how the astronauts kept up with all of this. They were the ones that were on the front lines. They were the ones making the appropriate remarks and the speeches to the heads of state. As if the rigors of the world tour itself weren't enough, two of the astronauts, Colonel Aldrin and Colonel Collins, left the tour to complete appearances elsewhere-one previously mentioned, to Atlantic City by Colonel Aldrin. Colonel and Mrs. Collins had rejoined us in Berlin after a side trip to Genoa, Italy, where he received City of Genoa Colombiana Medals and an International Institute of Research award. We were doing our best to keep up with it. As we traveled we would get cables from cities like two or three stops ahead of us that would have a proposed final schedule. One of the jobs that I did was to go through the cables and pick out what was being planned ahead at the next stops. Then Wade St. Clair and Nick Ruwe would review and give a thumbs up or thumbs down to what was being proposed. We were always saying that we needed a rest stop, but we had one true rest stop. That was in Rome. The American ambassador post was vacant at the time of our visit and the embassy was opened to us for the afternoon. We used the swimming pools and the tennis courts and just lounged around and ate American hamburgers, hot dogs, and potato salad. Some of us toured the catacombs under the embassy grounds. That was a true rest stop. But we had another, what was called a rest stop in Belgrade [Yugoslavia] where the astronauts started off on a duck hunt with  the representative of President Tito. I believe it was his deputy prime minister. The astronauts' wives were taken on a hydrofoil trip down the Danube and the rest of us were put in cars and buses, including the Air Force crew and all of the support crew, and were taken on a driving tour of the countryside. We all ended up for lunch at a country lodge and we were served a seven course Serbian lunch including roast pig and slivovitz. Have you heard of slivovitz? Its the national drink. It's served in little tiny glasses and burns as it goes down. It's like fire water. One sip is sufficient, just to say you've experienced it. That luncheon lasted until four or five o'clock in the afternoon. As we were leaving the lodge, my boss told me that he had gotten word that the chiefs at the hotel had obtained the ducks that the astronauts shot and were dressing them for dinner. After having all of that food for lunch we had to attend the duck dinner. And we couldn't say no lest we offend our hosts. Most of the traveling party appeared for dinner. That entire day was an experience I'll never forget. What was the longest flight or duration that you had between stops? ....Nixon wanted to take his family on a vacation and their plans were to start fairly soon so we had to fly straight from Tokyo to Andrews Air Force Base in one leg. That was quite a tiring experience . . .
One of the more memorable experiences we had was in Dacca [East Pakistan]. As soon as we approached the airfield you could see all of these people at the airport waiting to see the astronauts. The crew had to shut off the engines as soon as we landed because the crowd broke through the restraints and came running out onto the airfield. Since we could not approach the terminal, cars were sent out to the plane to take us on the motorcade to the hotel. It was a hot day. A very hot day. When you drive in a motorcade you are supposed to keep almost bumper to bumper to keep people from being able to squeeze in between the cars and thereby disrupting the motorcade. But, as I mentioned, there was absolutely no crowd control and the car engines started to overheat on the way to the hotel. One of the  security people for the astronaut wives came back to the car that I was in and told us that they were taking our car for the wives and that we had to get out of the car. In all of that humanity, we had to look for another car which was hard to find since the crowds had gotten in between all of the cars. Essentially, the drivers were on their own to try and find their way without following the car in front of them. We finally found a place to get into and we were sitting on each other's laps and crammed into the back seat of this little car. That was probably the hairiest experience. I was down right scared. I thought what if I can't find another car to get into what am I going to do? You just don't know what you'd do. The astronauts' car also overheated. I don't understand the mechanics but apparently when engines overheat, you can turn on the heater allowing the engine to cool so that you can go a further distance instead of stalling. Their driver turned on the heat and took a short cut through a soccer field in order to get to the hotel. In Bombay, India, the embassy estimated the crowd to be about 1.5 million people. There was an outside ceremony. At Dacca, they estimated there to be about a million people . . . In Kinshasa, Zaire, there was a 25-mile drive from the airport to the place that we were staying. They had us billeted in a compound of villas which President Mobutu had ordered to be built for an Organization of African States Conference and the compound was adjacent to the presidential palace and his offices. The crowd control there was totally opposite from what we found in Dacca because the policemen had these huge whips and if somebody stepped off the curb to get into the path of one of the cars in the motorcade or tried to get to the astronauts' car, they would use the whips on people. The compound where we were staying had a private zoo which the president owned and you could hear the animals, especially at night . . . In Tehran, Iran, the staff was invited to go to the vault where all of the Shah's family crown jewels were stored. The vault doors were on a time lock. The vault was opened-especially for us, but I believe it was still time locked. We were cautioned not to touch the glass display cases but somebody did and alarms started going  off and the heavy doors started closing. The security guards and the police were doing their best to hold the doors open while we all scurried out as fast as we could go. A lot of these events were televised also? Most of the arrivals were televised live. In some of the cities, a national holiday had been declared on the day of the astronauts arrival. It must have been impressive going to these various countries in the president's plane . . . Yes, it was. One of the embassy people told me that he was at the airport for one of our evening arrivals. He said that when we approached the airport and he saw the plane, with the presidential seal and the American flag imprinted on the plane, it just gave him goose bumps. It was quite an impressive plane. When the trip was over we all gathered under the seal and had a group photograph made . . .
During the State Department briefings we were told that whenever you heard the Star Spangled Banner that no matter where you were or what you were doing, you must stop, face the flag, and put your hand over your heart. This happened in Berlin as we came down the steps of the plane and the band started playing the Star Spangled Banner. One of our embassy people said that the scene was picked up on live television. Were you allowed to take personal items with you during the trip? We were allowed to have one suitcase to be stored in the hold of the airplane, and a hang-up bag which could either be up front with you in the cabin or in the hold, and a briefcase. I was able to smuggle in a wig box because in those days wigs were the rage and they really came in handy when it wasn't convenient to find beauty shops. We lived out of a suitcase, a hang-up bag, and a briefcase for the entire 38-day trip. One of our staff, Herb Oldenburg, had the important job to get the right luggage to the right room at the hotel when we got off the plane. He and his people would also collect the bags early in the morning on the day of departure to get them to the airport. It sort of became a game of Russian roulette whether to pack your bags and put them outside your room the night before a flight or to take your chances that you are going to get up early enough to get your bags out then. I generally put mine out at night and kept out what I was going to wear the next day and stuffed my nightclothes in my briefcase. When we were in Sydney, I was dragging my bags out in the hallway about two o'clock in the morning. I used my raincoat as a bathrobe because I wanted to save room in my suitcase for souvenirs. I was dragging my bags out in the hall with my raincoat on, my hair was up in curlers and I was in my bare feet. There was no one there when I opened the door and looked out but after I stepped out into the hall I heard this Australian voice behind me say "Good morning, young lady." I turned around and it was the Prime Minister of Australia! [Laughter] He had been to a social function down the hall and was walking by on his way out of the hotel . . . The trip was pretty intense. I lost 25 pounds during the trip. In retrospect, in looking at everything that made Apollo happen, probably one of the most difficult things for the crew members was in dealing with the public. They were naturally uncomfortable around the public and now suddenly they were on front stage to the world . . . It must have been very difficult for them. People were looking to them to say inspirational things. They were called upon to make speeches and remarks at every place they had a public appearance. Did you encounter any strange customs that you had to adhere to during the trip? In Australia, when we landed in Perth, the local officials insisted on coming onboard and spraying for tsetse flies. Nick Ruwe, our State Department guy, was highly offended that they would do that but they insisted on doing it anyway. We were told that when they came onboard to inspect the plane, we should just sit there and stare at them. When the tour was finished and the astronauts arrived back in the U.S. did they give a report to the President? Yes. There was a White House ceremony on the day we returned, November 5. 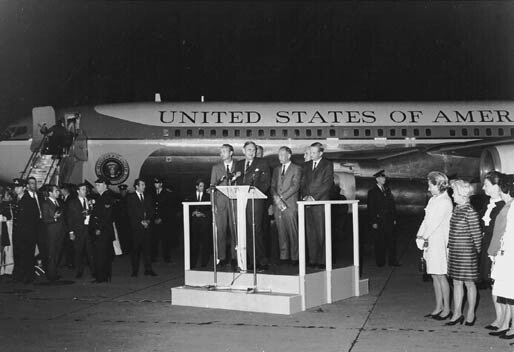 During the ceremony, President Nixon officially welcomed the astronauts back. The astronauts presented the report, along with their letter, summarizing the report, to the President. The support staff and our families were also present during the ceremony. After all of this was done, did the astronauts have an opportunity to take a real vacation? I'm sure they did. However, about a month after they returned they were sent to Ottawa and Montreal, Canada. Apparently, these  stops couldn't logistically fit into either the beginning or the end of the world trip. They were received by the Prime Minister of Canada in Ottawa and made appearances there and in Montreal. From my own personal viewpoint, I know that when the trip was over, I was glad to get back home to my family. I had three children who were at that time 3 (Paul), 11 (Susan), and 13 (John). My ex-husband and the children met me at the White House for the welcoming ceremony. When we left to get the car from the parking garage, all of a sudden it dawned on me that there was nobody bringing me an official car right away. Reality had set in. I was just worn out. When we got home, I didn't even unpack my bags, I just sat down in a reclining chair and sat there all night. The whole time that we were traveling, the adrenaline was at its peak and I could rest from being afraid of missing the wake up call, afraid of missing the plane. All of a sudden everything is down, you don't have to wake up at a certain time the next morning. You don't have to pack a bag to put out in the hall. It was like you really came down and it took a couple of days to get yourself back to the functioning level-to return to Earth so to speak. I'm glad that I was given the opportunity to take part in such an adventure . . . It was really quite unique and a wonderful experience and one that I never would have had had I not worked for NASA. I never would have dreamed of going to all of these places. I'm glad that I did it but I would not want to do it again. What are some of your thoughts on the achievements made by Apollo? I worked the protocol part of the Apollo 11 launch and it was really quite mind boggling to see. We were at Cocoa Beach a week ahead of the actual launch day and people were already gathering to witness the launch. The evening before the launch, there were people sleeping on the beaches and in their cars because there were no more hotel rooms. Some spent the night sitting in chairs in hotel lobbies. The motel and restaurant marquees at Cocoa Beach were all saying "Good Luck Apollo 11." There were a lot of well known people there for the launch. You could not help but feel  that there was something big happening and you were just glad to be a part of it. My family went down for that launch. I remember when it took off, when it lifted off the pad, I could not help but think, what are they really going to experience once they get there. Are they going to get back? Because in spite of all the things that you heard about the mission being carefully planned and they knew what to expect and everything was going to go according to the flight plan, I always had a feeling in the back of my mind well, what if . . . I thought that the eyes of the world were focused on Cocoa Beach at the Kennedy Space Center. I just felt glad to be a part of it and I wanted my children to see it and to share the experience with me. My youngest child was just two-and-a-half years old and he vaguely remembers it because of the launch sequence when it starts to lift off with all of the noise and smoke. My two older ones will never forget it. I know I certainly won't. This was such a significant event for the United States and NASA and I felt privileged to have had a very small part in it. 1. The crew of the Presidential Aircraft assigned to the first half of the Giantstep Apollo 11 World Tour (from Washington to Rome) include the following: Maj. David H. Shaw, Aircraft Commander; Maj. Lester C. McClelland, Aircraft Commander; Capt. Adolph C. Zerumsky, Navigator; S/Sgt. Walter Battic, Guard; M/Sgt. James H. Brown, Steward; S/Sgt. Larry N. Coleman, Guard; S/Sgt. Errol E. Devore, Guard; M/Sgt. William W. Gibbs, Jr., Flight Engineer; T/Sgt. John R. Jester, Guard; M/Sgt. Larry L. Kerns, Flight Engineer; M/Sgt. Robert A. Koehler, Radio Operator; S/Sgt. Eugene L. Munger, Steward; S/Sgt. George R. Phillips, Guard; M/Sgt. Robert A. Rouse, Steward; M/Sgt. Darrell F. Skinner, Radio Operator; M/Sgt. Buddie L. Vise, Steward; M/Sgt. Doyle G. Whitehead, Steward. The crew assigned to the second half of the tour (from Rome to Washington) include the following: Maj. Kenneth L. Cox, Aircraft Commander; Maj. Frank O. Pusey, Aircraft Commander; Maj. Robert W. Pollard, Aircraft Commander; Maj. Donald F. McKeown, Navigator; M/Sgt. William A. Scholl, Flight Engineer; M/Sgt. Donald E. Caton, Flight Engineer. 2. In addition to the flight crew for the presidential aircraft, those that went on the world tour include the following: The crew of Apollo 11 and their wives-Neil Armstrong, Janet Armstrong, Michael Collins, Patricia Collins, Edwin Aldrin, Jr., and Joan Aldrin; NASA support personnel-Howard G. Allaway, Public Affairs Office, Office of  Manned Space Flight, NASA; Geneva B. Barnes, Secretary to the Dirctor, Public Events Division, Office of Public Affairs, NASA; Simon E. Bourgin, Science Advisor to the U.S. Information Agency (USIA), Office of Policy and Plans; Dr. William R. Carpentier, Flight Support Officer for Apollo Preventive Medicine Office, NASA; Joan Carroll, Secretary to the Assistant Chief of Protocol, Department of State; William Der Bing, Deputy Chief, Special Events Office, Manned Spacecraft Center, NASA; Robert B. Flanagan, Senior Security Specialist, NASA; Richard Friedman, Information Officer for International Affairs, NASA; Joseph Kidwell, Protocol Assistant, Office of Public Affairs, NASA; Charles G. Maguire, Staff Assistant to Deputy Assistant Secretary for Operations, Department of State; L. Nicholas Ruwe, Assistant Chief of Protocol, Department of State; Wade St. Clair, Director, Public Events Division, Office of Public Affairs, NASA; Julian Scheer, Assistant Administrator for Public Affairs, NASA; Elton Stepherson, Jr., Special Assistant to the Area Director for Near East and South Asia, USIA; William P. Taub, Visual Information Officer, Office of Public Affairs, NASA; Herbert Oldenberg, Department of State; Thoreau Willat, Voice of America; Edward S. Hicket, Voice of America; Enrique Gonzales-Reguerra, Voice of America; Petro Luis Kattah, Voice of America. There were also NASA security, public affairs people, and White House advance men who traveled ahead of the main group, leapfrogging from one city to the next, coordinating security, logistics, and any last minute surprises on the schedules. These people were as follows: O.B. Lloyd and Walter Pennino, NASA Public Affairs Officers and advance team; Frank Dukes and Arnold Garrott, NASA Security Officers; James Bertron, David Cudlip, Leonard Steuart and Edward Sullivan, White House advance team. 3. The itinerary for the "Giantstep Apollo 11" world tour from September 29 to November 5, 1969 included the following stops: Mexico City, Mexico (Sept. 29-30); Bogota, Colombia (Sept. 30-Oct. 1); Brasilia, Brazil (Oct. 1); Buenos Aires, Argentina (Oct. 1-2); Rio de Janeiro, Brazil (Oct. 2-4); Las Palmas, Canary Islands (Oct. 4-6); Madrid, Spain (Oct. 6-8); Paris, France (Oct. 8-9); Amsterdam, Holland (Oct. 9); Brussels, Belgium (Oct. 9-10); Oslo, Norway (Oct. 10-12); Cologne/Bonn and Berlin, Germany (Oct. 12-14); London, England (Oct. 14-15); Rome, Italy (Oct. 15-18); Belgrade, Yugoslavia (Oct. 18-20); Ankara, Turkey (Oct. 20-22); Kinshasa, Zaire (Oct. 22-24); Tehran, Iran (Oct. 24-26); Bombay, India (Oct. 26-27); Dacca, East Pakistan (Oct. 27-28); Bangkok, Thailand (Oct. 28-31); Perth, Australia (Oct. 31); Sydney, Australia (Oct. 31-Nov. 2); Agana, Guam (Nov. 2-3); Seoul, Korea (Nov. 3-4); Tokyo, Japan (Nov. 4-5); Elmendorf, Alaska (Nov. 5); Ottawa and Montreal, Canada (Dec. 2-3). Replica of the plaque left on the Moon mounted on a walnut backing. A plaque was presented to the leading official at each city. Replica of Goodwill Message disc left on the Moon, eight-power magnifying glass and framed photograph. These were presented to the signers of each of the individual messages that were contained in the original message disc. Nations on the Apollo 11 World Tour that provided goodwill messages included on the message disc include the following: Argentina, President Juan Carlos Ongania; Australia, Prime Minister John Gorton; Belgium, Baudouin I, King of the Belgians; Brazil, President Arthur Da  Costa E. Silva; Colombia, President Carlos Lleras Restrepo; Congo, President J.D. 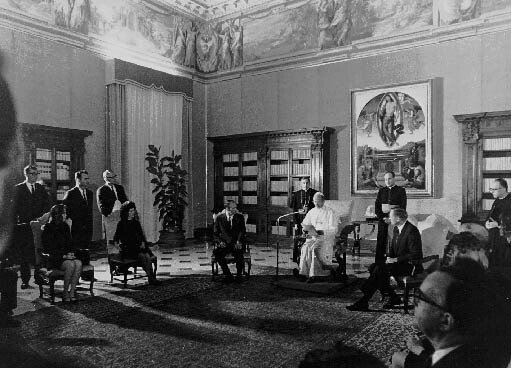 Mobuto; India, Prime Minister Indira Gandhi; Iran, Mohammad Reza Pahlavi Aryamehr; Italy, President Guiseppe Sarget; Japan, Prime Minister Eisaku Sato; Korea, President Park Chung Hee; Mexico, President Gustavo Diaz Ordaz; Netherlands, Juliana R.; Norway, King Olav R.; Pakistan, A.M. Yahya Khan; Thailand, Bhumibol Adulyade, King of Thailand; Turkey, President Cevdet Sunay; United Kingdom, Elizabeth R.; Vatican, Pope Paul VI; Yugoslavia, President Josip Broz-Tito; Canada, Prime Minister Pierre Elliott Trudeau. Color photographs from the Apollo 11 mission (8" x 10" mounted on 11" x 14" mats; 11" x 14" mounted on 16" x 20" mats) were autographed aboard the aircraft for presentation to lesser dignitaries (i.e. ministers, ambassadors, mayors, etc. ).